Leaving Bangkok we had acquired a third wheel to our group – Greg, who we first met in California and then saw again in New Zealand. 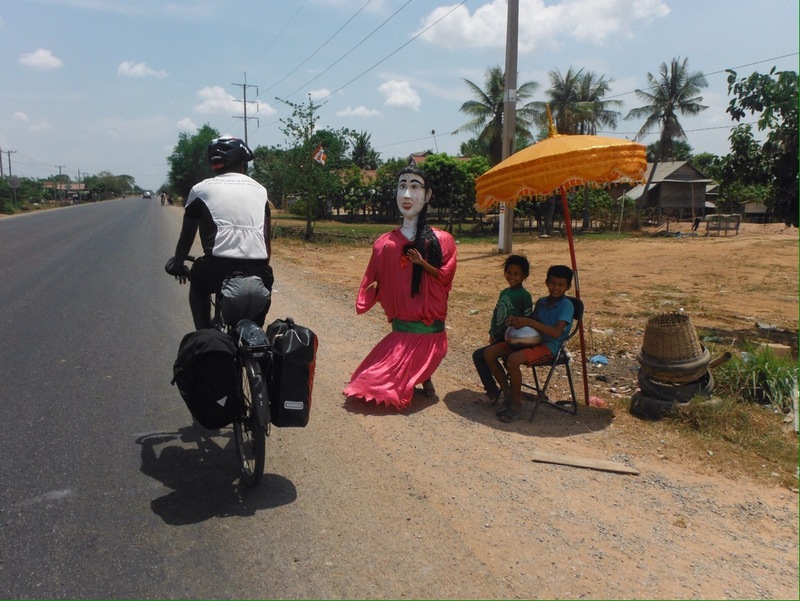 He had been cycling in Thailand and also planned to go to Cambodia so we joined forces and two became three. 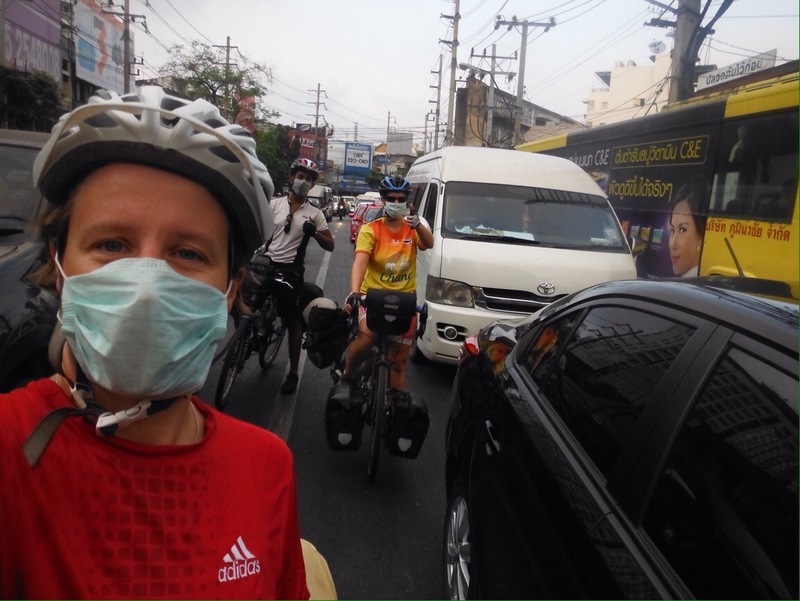 Riding out of Bangkok was as horrible as riding in, but not for as long. 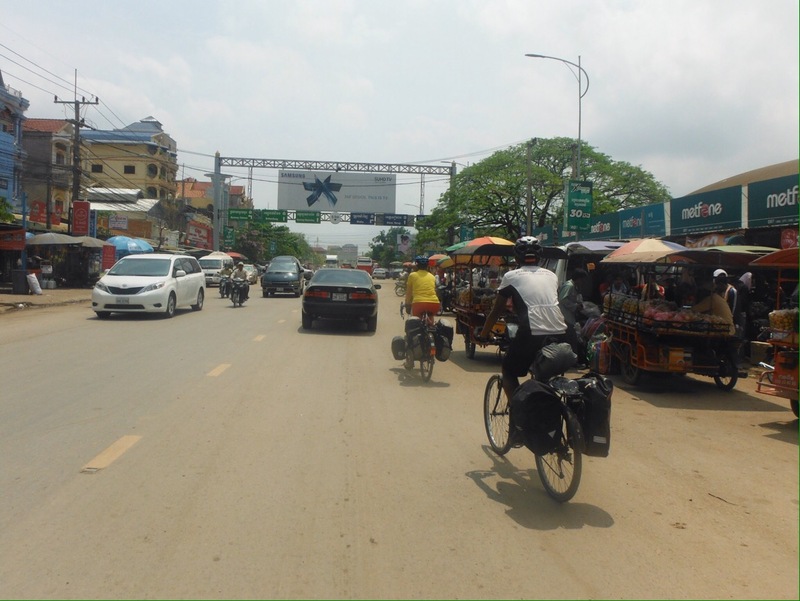 We we keen to get there as fast as possible so took a direct route, following flat, quiet highways for two days to the Cambodia border. It wasn’t particularly interesting, although on the second day we stopped early as a storm was forecast, we could see it coming as we pedalled madly back to the hotel after lunch and as we were riding a lightening strike hit a lamppost at the side of the road. We don’t mind a bit of rain (though can also often be found sheltering from it) but lightening is pretty scary so we were pleased to have stopped early and have plenty of time for speed scrabble. This was Gregs stag do so we even had an extra mango and went wild. If crossing from Malaysia to Thailand was like Switzerland to Italy, Thailand to Cambodia was like Montenegro to Albania. It was like entering a new world. A crazy, noisy, dusty one. 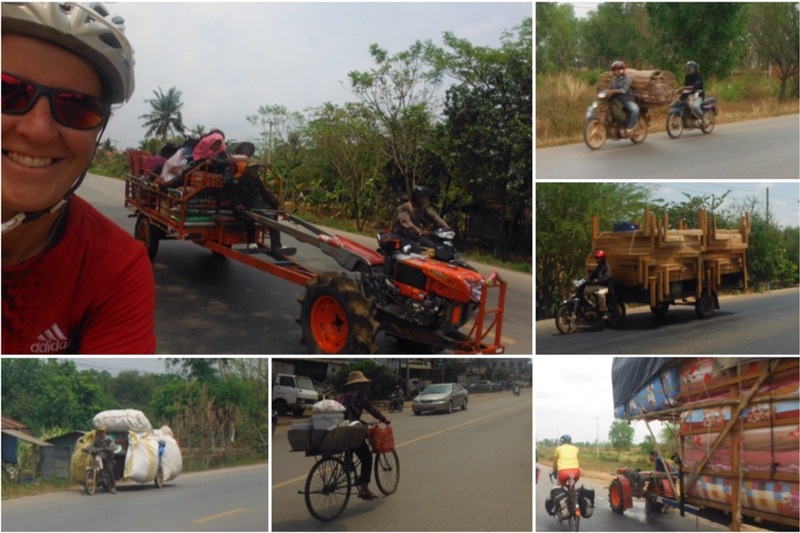 We rode up to the border past a queue of big trucks that was at least 2km long, and were stamped out of Thailand along with people pushing hand carts packed as high as possible with goods. When I think of no mans land – the piece of land between exiting one country and entering another – I often imagine a barren, empty wasteland. And I’m sure that what it is usually like. It was in Europe anyway. But not here. As soon as you are out of Thailand the craziness begins. People are selling things from the back of motorbikes, tuk tuk drivers touting for custom, the road was packed with traffic and people. Throw in the complication that Thailand drive on the left and Cambodia on the right and you have 500m of chaos. 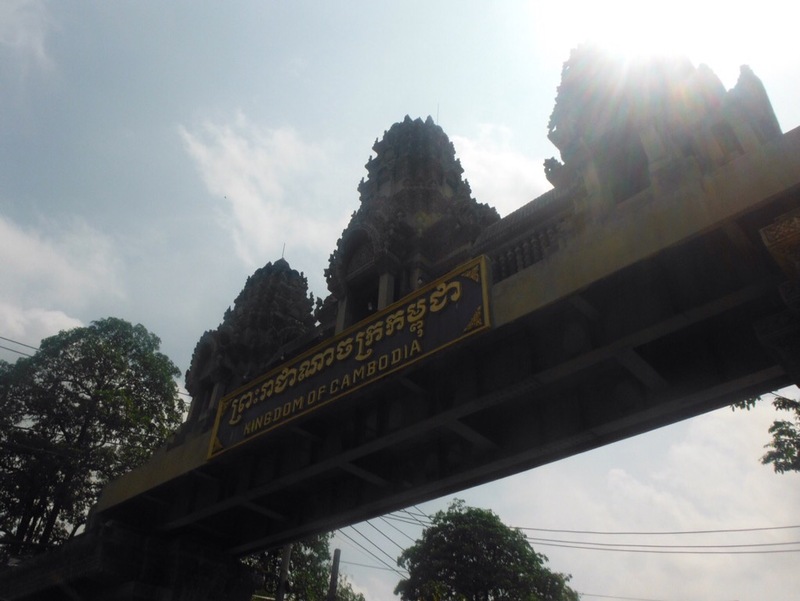 Getting into Cambodia was fairly straightforward, we already bought visas online to save one of my few free passport pages so we just had to queue with the bus passengers to be stamped in. Strangely many of them seemed to be slipping notes over the desk with their passports and then giggling when they exited the building – maybe it’s some kind of “backpacker must do” in SE Asia to give a bribe but we didn’t bother and all was fine. I stood with the bikes while Debs and Greg went to sort SIM cards which took at least as long as the immigration process. In that time I saw a load of cows crossing the road between traffic, a side road that was actually a river so people were wading or driving through, lots of litter, and a lady carrying several trays of eggs balanced on her head. Kids came up to the bikes and played with the flags. It was just after lunch by now and it was extremely hot, the riding wasn’t too nice as the road was dusty and trucks would spit a nice mixture of exhaust fumes and dust as they sped past. The landscape was much more barren than Thailand, no trees, so no shade, which seemed to add to the heat. We stopped at one place for a fizzy drink but could only see beer or water. It was great to see schoolkids riding home on bikes. One size bike fits all in Cambodia, so there were some small kids on really big bikes. The other great thing was how excited every child seemed to be to see us. Every single one would shout hello and wave, sometimes we couldn’t even see them so just had to shout back in a general direction. Kids here seemed to have the biggest grins ever, their whole faces beamed as they waved. We made it 50km to the next big town, Sisophan, checked into a guesthouse for the princely sum of $10 for an en suite air con room, and walked to the night market. We soon discovered that the people of Sisophan do not walk. We were the only ones trying to dodge the mopeds. Getting our first meal was a bit of a challenge, we found a stall with vegetables on display, asked for vegetables, and were told no. The same happened at the next one, but we were pointed next door. First we were offered beer, but then finally got a yes for vegetables. As the cooking started Debs had her usual peanut panic (they like to sneak them into dishes in Asia), went over to check there were no nuts going in and was asked “do you want cigarettes?” Wherever food is served, even if it’s the smallest cart, there’ll be cigarettes for sale too. It took a while to get to grips with the money in Cambodia. The official currency is the riel but dollars are also accepted and commonly used for anything over $5. So if you buy anything for less than a dollar, you use riel, anything over a dollar you can use either, or a combination if you wish. Equally you might get your change in either or both. It’s 4000 riel to the dollar, so if something is $1.50, and you pay with $2, you’ll get 2000 riel change. If you pay with $5 you’ll get either $3 and 2000 riel or 14000 riel or something in between. It is very confusing and impressive how well everyone here knows their 4000 times table. I still didn’t really get it when we left the country. It does mean that for ease, a lot of things seem to be $1, which makes a fried noodle and egg dinner from a food cart a great deal. The next day was another early start for the hot 100km ride to Siem Reap. 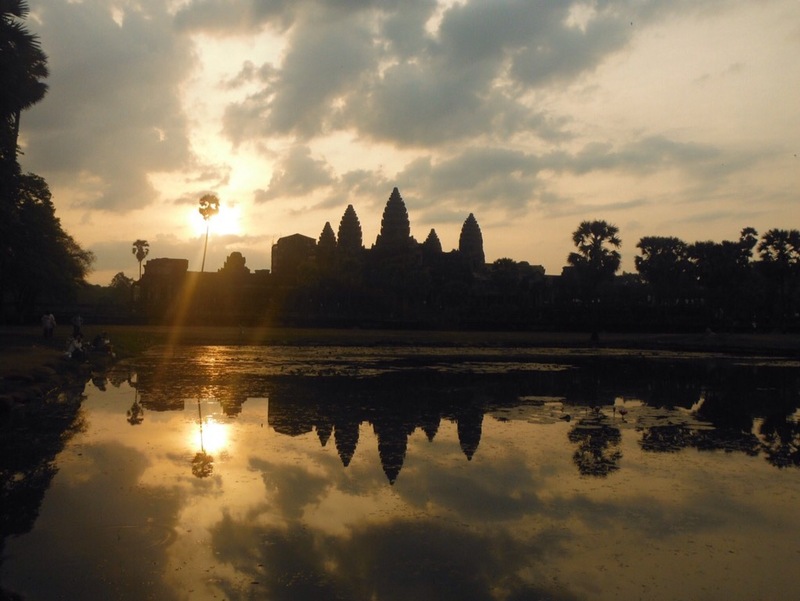 Our main reason for visiting Cambodia was to see the Angkor Wat and surrounding temples, probably our only ‘must-see’ sight in Asia. The highway remained hot and dusty but the waves and hellos continued. It’s hard to get bored here even on a highway because there is so much going on alongside it. It’s not like riding on the A1. This is the only road in this area so people live by it, trade by it, go to school on it, travel on it by whatever means. You’d hear a slow moving vehicle behind and wait to see what overtook you, or more interestingly, what it was carrying. These guys deserve and award for innovation in what can be carried just using a motorbike. Trucks went past piled high with mattresses, tables, melons, people, live pigs, you name it, it can be carried. People would sit on the top of whatever was being carried on the back. Families squeezed onto mopeds. With that and all the waving, and being alert for cows or goats wandering across the road, the miles flew by. Approaching Siem Reap, everything changed. Posh hotels started emerging, the litter decreased, and we joined a well kept road with a line of trees in the middle. This was clearly a place designed for people to come and spend money, and it couldn’t look less like the Cambodia we had spent the last two days riding through. Kids stopped shouting and waving. Western chain restaurants, coffee shops, and nice bars lined the roads in. It was all quite surreal. It seemed like it had just been transplanted into its surroundings, a bit like when you drive into Las Vegas. 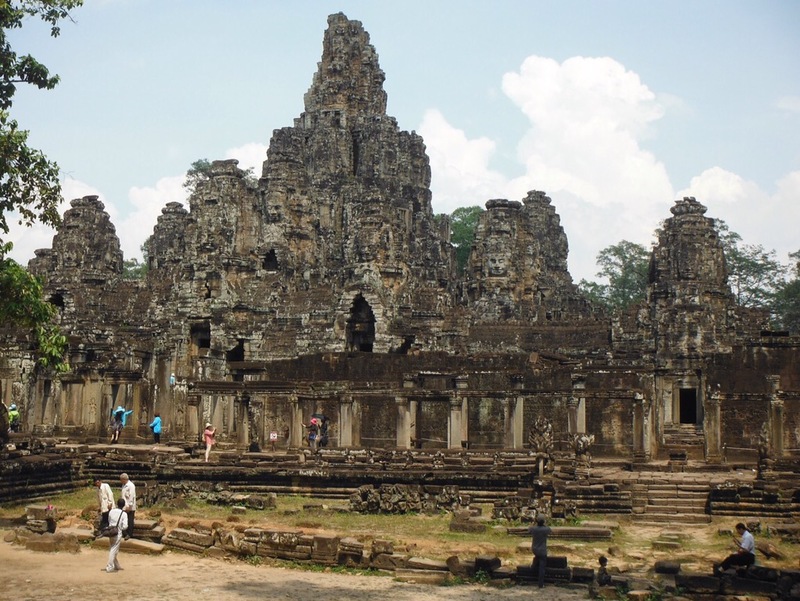 We spent a day relaxing and wandering around the sights, of which there are practically none, because people come here to go to Angkor Wat. We actually got a bit uncomfortable being surrounded by all of this money in a country where so many people live in poverty. Even in Siem Riep there are people so thin they can hardly move, laying down opposite a coffee shop where a cappuccino costs enough to feed a family for a day. I don’t know what the answer is as the town and Angkor Wat brings in a huge amount of money but it just made us very uncomfortable. And we were of course a part of it – we were there to visit the temples and we also bought postcards and fruit shakes. We even went to a (non-fancy) coffee kiosk, where Debs was surprised to be offered breast milk in her coffee. I suggested it was more likely to be fresh milk. Panic over. This place isn’t that weird. 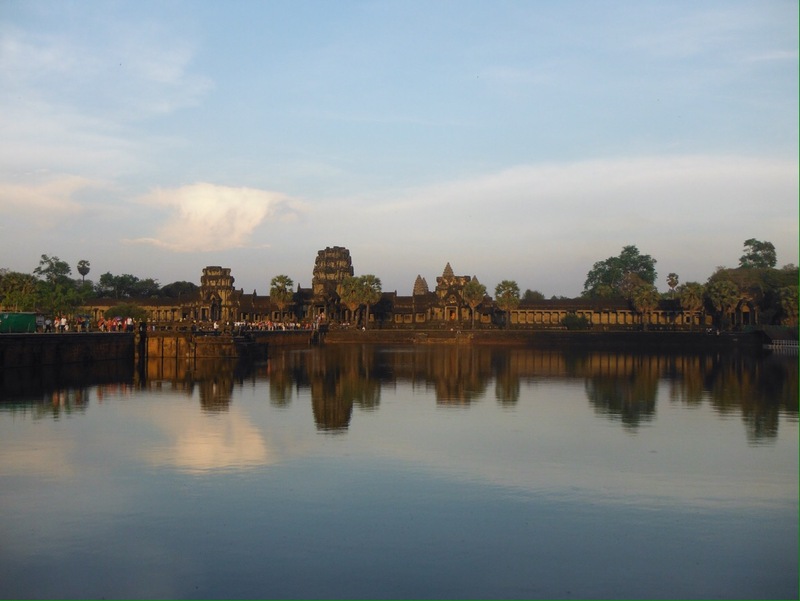 The next morning we joined the hoards of people at the main Angkor Wat temple for sunrise. It was a special sight, only slightly tarnished by the number of tourists sitting on areas you are not supposed to, brandishing selfie sticks and complaining loudly about how tired they are after flying in from Chang Mai the day before. 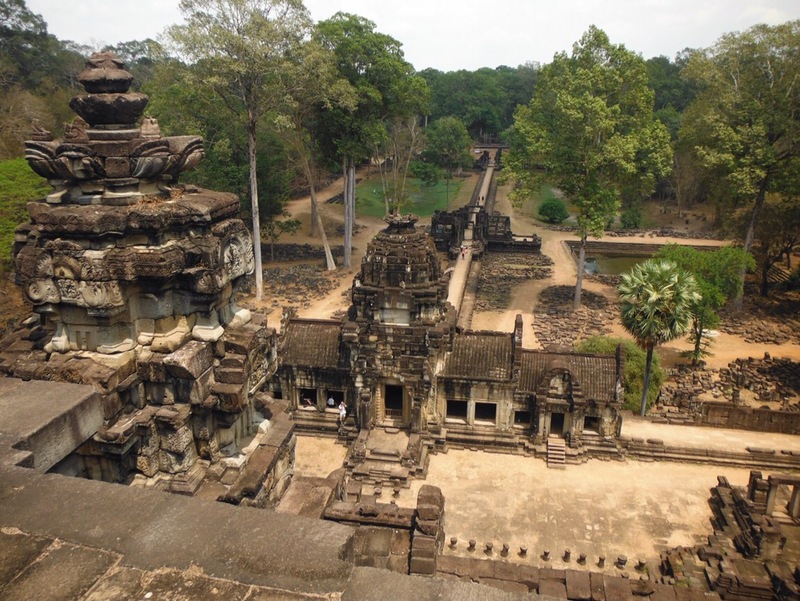 We found Angkor Wat the least impressive temple to actually walk round, and soon moved on to Ta Phrom, the temple that has been left to be consumed by trees and was used in the film Tomb Raider. 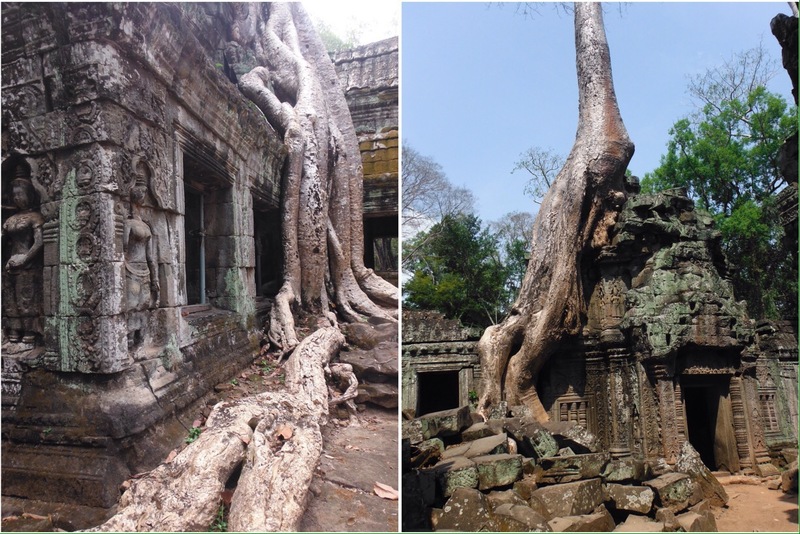 Seeing the trees simultaneously push apart and hold together walls and other parts of the temple was amazing. It made it more atmospheric, and it was hard not to be impressed at the power of nature to overtake the buildings. Having the bikes was great as we could just ride around between the temples, we also visited the other of the ‘top 3’, Bayon, and stopped at a few smaller ones that were just by the side of the road – we usually had these to ourselves. The heat got up and we realised how much harder it is to wander around than ride a bike in the afternoon sun so by 2 o’clock we were templed out and went back for a nap. It’s also very tiring being shouted at “hey, lady, buy trousers? Drink? Scarf?” and fending off the very cute but incredibly resilient children who surround you and try to sell you things. It’s so sad, these kids should be at school, and the first English they have been taught is how to ask for money. One was so small she couldn’t even form the words properly but she was saying “two for one dollar, three for one dollar” by using the same tone and rhythm as the (slightly) bigger kids. Anyone who manages to wander around from sunrise to sunset on the same day deserves a medal. Three became two again the next day as Greg carried on east towards Phnom Penh and we turned north to return to Thailand. 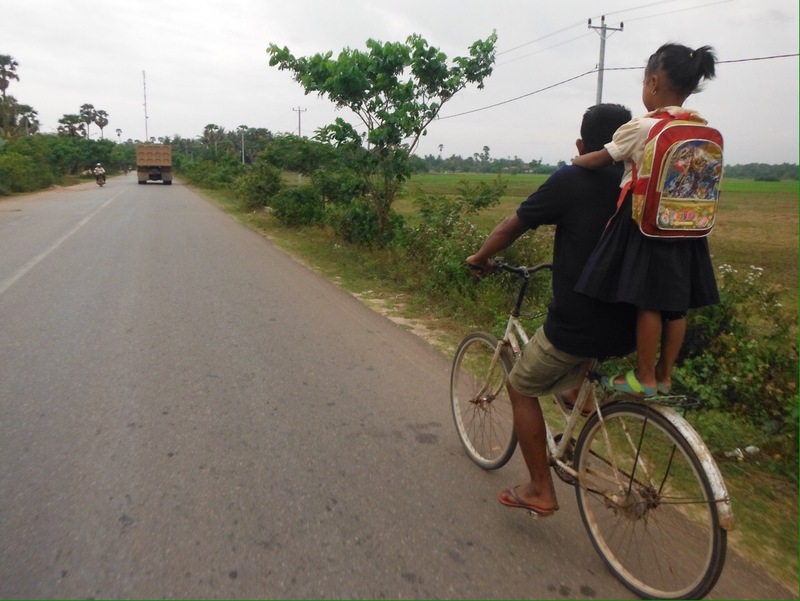 After about 10km of Siem Reap outskirts we were back into small villages and children were back to smiling and shouting “hello” rather than “dollar”. We stopped for second breakfast at a table full of army men who gestured we sat down. Two of whatever they are having please, and we got two bowls of noodle soup. On the table were a few colanders with flowers in, nice table decoration we thought. There we were eating our soup when one of the military men came over and strongly suggested that the flowers were to go in the soup. Not wanting to argue with a man with a gun, Debs threw in a few stalks, only to be told (despite us not understanding the words, the meaning was clear) that the petals were the best bit. So in they went. I somehow got away with eating regular non-floral soup. 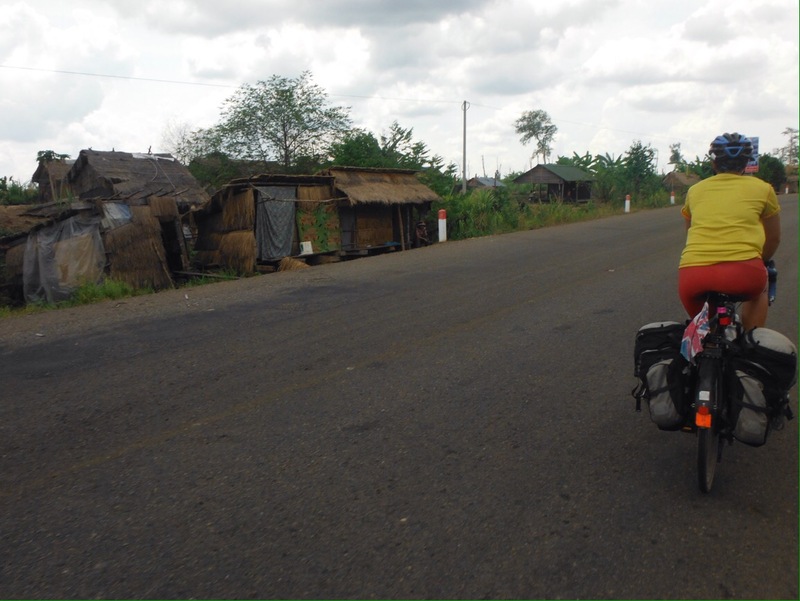 That day we passed through the most basic villages we had seen yet, and it was sad to see people living in such conditions. Wooden shacks were built on stilts, with streams of sewage and litter running underneath. There were many foreign aid signs. Kids were not at school. But the people kept smiling and waving. Our final destination was Anlong Veng, close to the border with Thailand, and winner of the most dusty town we visited award. 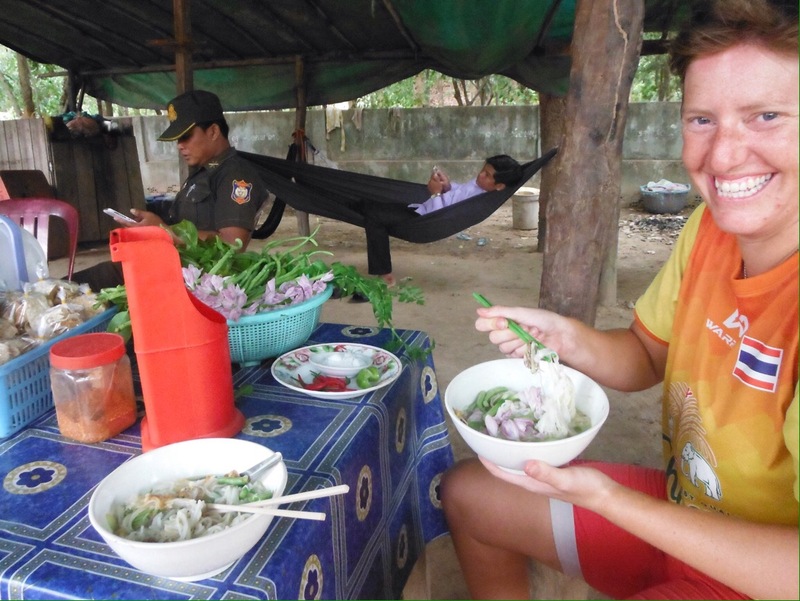 A final dinner of fried noodles, vegetables and fried egg on top for $1 – we had grown used to these in our short time in Cambodia – fuelled us for a mean climb up to the border the next morning. 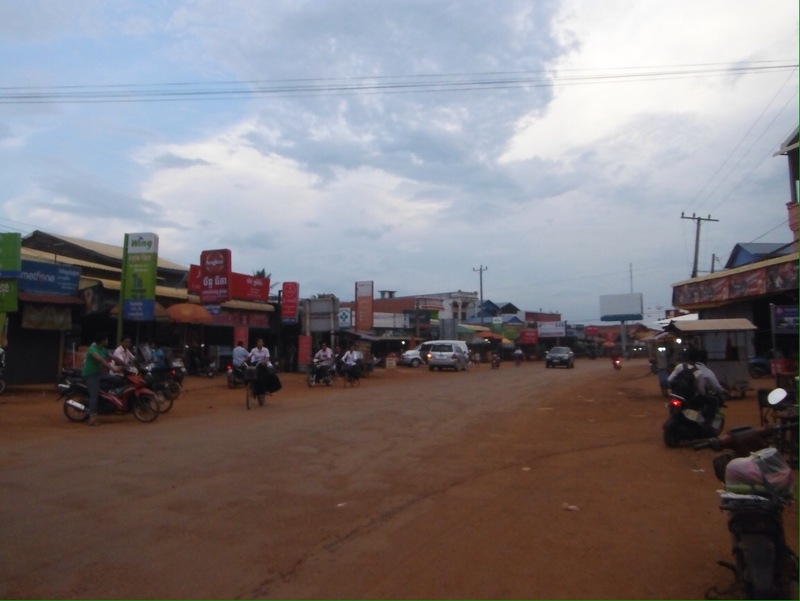 Having ridden practically flat roads our whole time in Asia this was quite the challenge and we were dripping with sweat when we reached the very odd border town of Choam which was practically deserted apart from a few food and drink stalls. 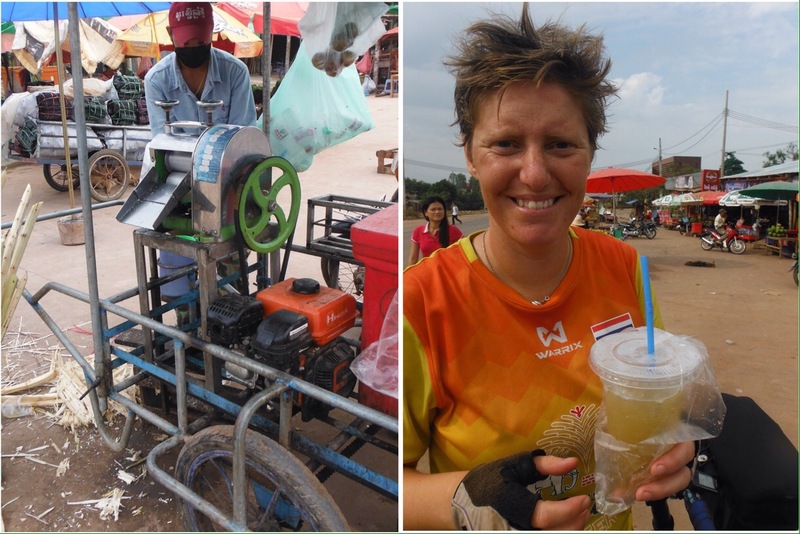 We spent our remaining riels on our first sugar cane juice, made by squeezing sugar cane through a mangle type piece of machinery. 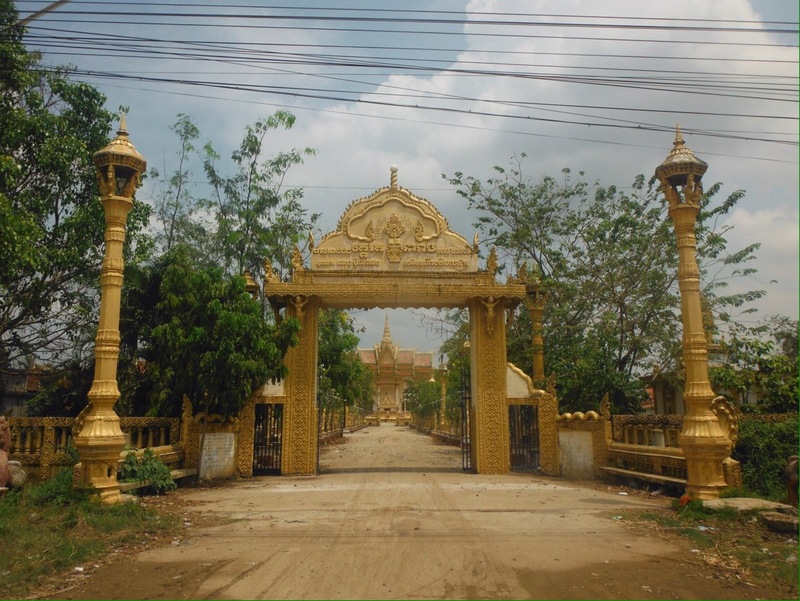 Leaving Cambodia couldn’t have been more different than entering – there was nobody else at the border so the Cambodian officer took his time inspecting every page of my passport at least three times before finally waving us through. Cambodia had been fun, but the thought of having trees to shade under and not being covered in dust every time a vehicle went past pleased us immensely. Five ways to GetOutside near you! Back to reality: I miss my spork! This website follows the outdoor adventures of Debs and Jo. In 2017 they completed a very long bike ride. Check out what we’re up to now!